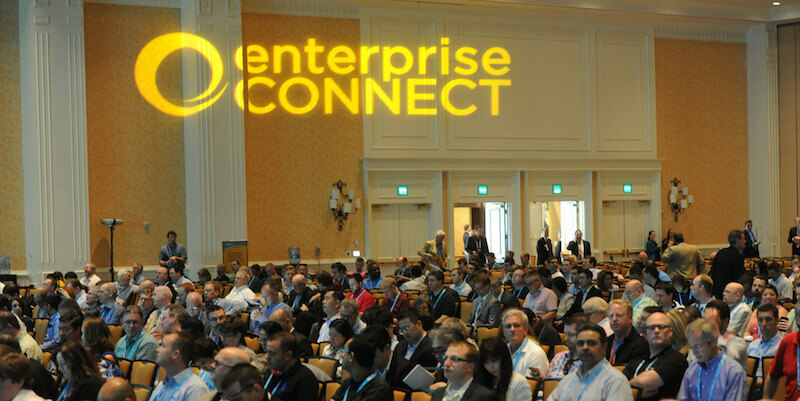 Enterprise Connect is the premier event where everyone in our industry — communications, collaboration, and productivity — gets together every year. It’s a great opportunity to see the latest and greatest technology in our space and the newest innovative products that are being released. It’s also an ideal platform for working with partners and customers who are all aligned about creating solutions that can push collaboration forward and drive productivity. Historically, if you go way back, Enterprise Connect was about voice telephony and technologies around voice calling, and over the years it’s morphed into Unified Communications. And now I think it’s gone beyond Unified Communications, and communications in general, to talk about productivity and collaboration, and the intersection of these traditional communication technologies with productivity. “For the first time, the industry is producing products that solve real collaboration problems, are easy to use and have the potential to grow and change with an organization’s needs,” Dave told us. Team collaboration applications are really at the forefront of driving productivity gains with teams. So this is one of these newer areas where our industry is headed. Of all the sessions at Enterprise Connect, this session is probably one of the most focused on driving real improvements in productivity for teams. I believe that this one of the sessions that’s going to show a lot of innovation — not just for the sake of innovation, but innovation for the sake of driving real business results. In the session, Dave will be sharing his analysis of a range of team collaboration applications, all through the lense of a 50-seat example. He’ll be looking at what they offer in terms of integrations, how they may or may not connect to legacy platforms, and generally what how the applications differ from each other. Of course, it will be very interesting to see how our friends and competitors in the industry have either complementary or competing products, in terms of their capabilities and also how they effectively measure up. The session will be looking at features in terms of functionality as well as in a larger context. I expect that this will be a uniquely interesting session, as well as a very vendor-focused session. By vendor-focused, I mean really looking at what are the specific solutions out in market: How do they compare from a functionality and pricing standpoint? And it’s being done by an independent third party who’s taking an unbiased look at those technologies. If you’re planning to attend this session, I would say the same thing I would for any session: go in with an open mind and a clear sense of the needs of the teams you work with. Because while the session is focused on team collaboration applications, everyone’s approach to team collaboration is as varied as there are different ways of teams working. Sometimes it’s challenging to just develop a set of criteria and sort of a numerical ranking and say, “Is someone better or worse than the other?” Of course, there are many different scenarios, different industries, different work groups and functions — and they all have their individual requirements. At the end of the day, you’ll want to think carefully about what the particular requirements are for your team and map those into the data that Dave will be presenting on all the different solutions. The Enterprise Connect session “Team Collaboration Shootout: How the New Breed of Apps Stack Up” is Tuesday, March 8, from 8:00 to 8:45 a.m. in Sun B. It is part of the Unified Communications and Collaboration track.